Thread is also a new wireless protocol that recently has entered the IoT market. 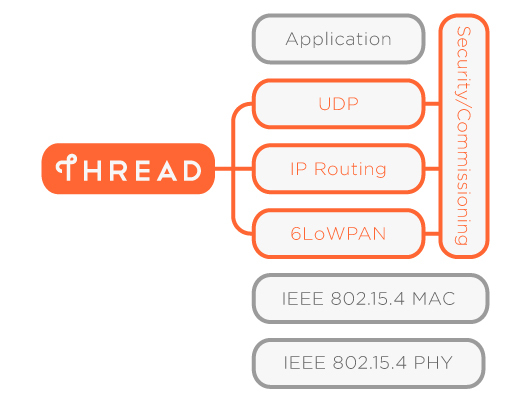 Its seven founding members aim to develop Thread, a new IP-based wireless networking protocol, as a better way to connect products in homes and to realize the IoT. The figure above depicts the Thread protocol stack. Thread has not standardized the application layer, which gives application developers the freedom to develop the applications they deem fit. The IP support of Thread makes it suitable for developing open systems; essentially making it easier to interface with other IP enabled mobile devices. On the network layer (NWK), Thread supports UDP on top of 6LowPAN. Thread also provides a horizontal layer that provides security and authentication functions that enables devices to securely exchange information. On the media access layer (MAC), Thread supports a mesh topology with a maximum of 250 nodes. For the physical layer (PHY) Thread used the IEEE 802.15.4 wireless RF specification that operate in the open 2.4 GHz band, allowing for a data rate of 250 kbps.